weServeEats is an organization dedicated to feeding hungry children. Notice that the "we" of "weServeEats" is not capitalized. This is because, although it is our actions that make a difference, it is God who has given us the opportunity. It's He who tells us 'Whenever you failed to do one of these things to someone who was being overlooked or ignored, that was me—you failed to do it to me.' (Matthew 25:45, The Message) The purpose of weServeEats is to not overlook anyone, to feed those who need fed, and to give God the glory for it all. The founder of weServeEats, Breanna Humphries, has wanted to make nutrient-packed, cost-efficient food for hungry kids since she was in high school. In 2012, she found an organization that was already doing just that. Breanna rallied her community to come together to package over 71,000 meals for hungry kids. 9,000 of those meals stayed in her hometown, going to local food banks and youth centers. 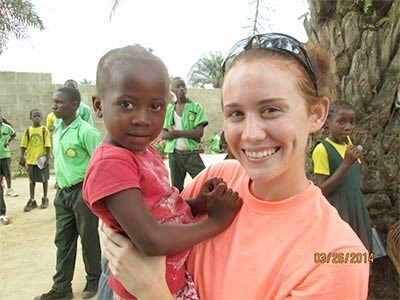 Breanna learned about Liberia while taking an economics course at The Ohio State University. In just a few short months of writing papers and taking tests, she fell in love with the country and felt a calling to help the vast number of starving children there. Globally, every 3.6 seconds, a person dies of a hunger related illness; 75% of them are children. In March of 2014, she and her mom, Laurie, traveled to Liberia to see the need first-hand. The trip sparked a bigger project. Breanna’s goal was to raise enough money to send 300,000 meals to the 600 orphans she encountered. Yes, there are, and every life is valuable. There are countless opportunities to volunteer and donate to organizations who help children here in the United States and that is your choice. But I challenge you with this: when you give a hungry American child $1 out of your pocket, they can go buy a hamburger and be happy. Great, but a hamburger doesn't provide them with the nutrients they need to grow and be strong. By donating just $1 to weServeEats, you're providing a child, just like an American child, with three complete meals full of vitamins and nutrients, protein, and carbohydrates to make sure that their nutritional needs are met. These children don't have the option of a fast food hamburger and they gratefully accept the meals we provide, knowing that it may be their only substantial meal of the day. If you're still not convinced, consider helping these organizations that support local children right in our area: The Lifewell or Bethel Community Center.